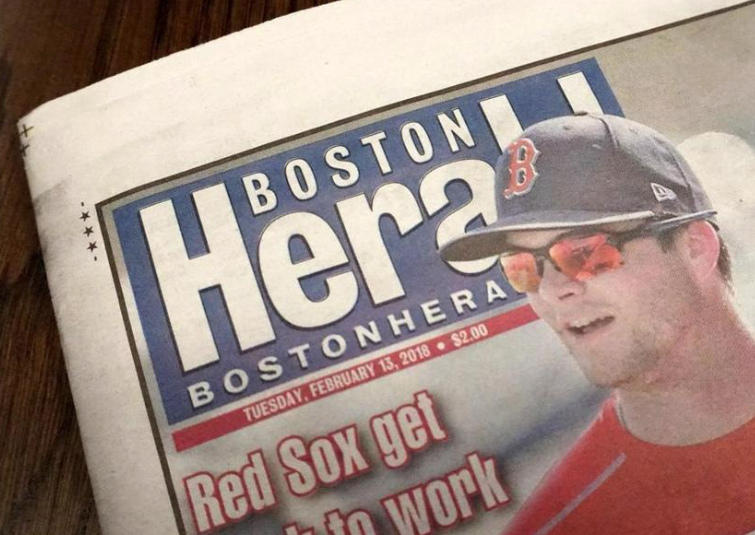 For the past several months, the Boston Globe has been playing catch-up to the Herald in covering the sale of the feisty local tabloid. 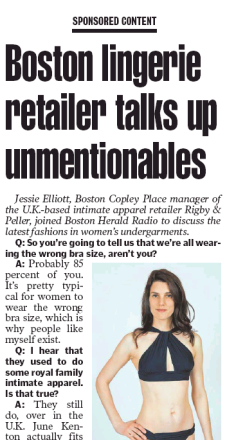 Today the Globe caught up. 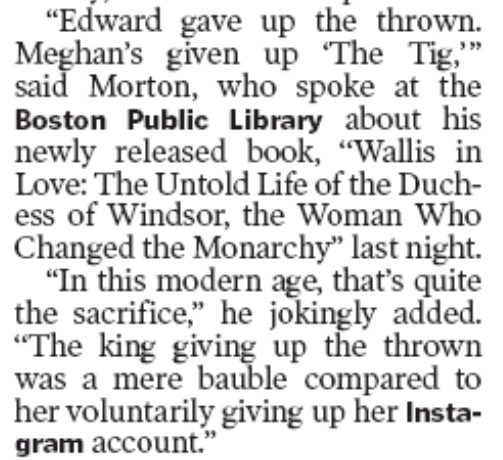 Under the unusual byline “Globe Staff,” the stately local broadsheet reported the details of yesterday’s bake sale. 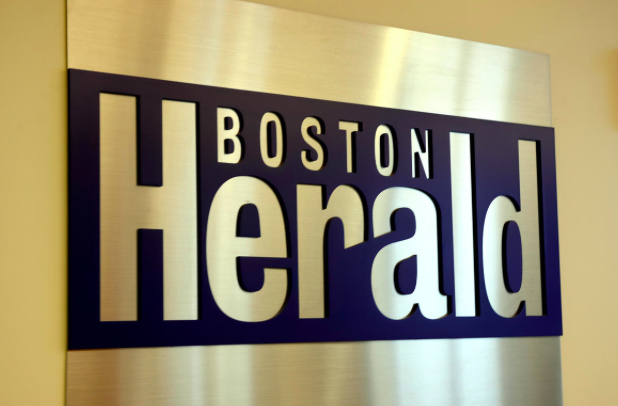 Digital First Media is poised to become the new owner of the Boston Herald after besting competitors with multiple higher bids during a bankruptcy auction Tuesday that netted nearly $12 million, according to newly filed court documents. A transcript of the auction held in the office of Herald law firm Brown Rudnick revealed that Digital First opened with a bid valued at around $7.6 million — higher than the offers already in place from two other competitors, GateHouse Media and Revolution Capital Group. After GateHouse countered Digital First with a slightly higher offer, Revolution Capital dropped out, leaving the two competitors to trade bids several times until Digital First’s final offer proved too rich for GateHouse, according to a transcript of the auction filed with bankruptcy court in Delaware. Crosstown at the Herald, reporter Brian Dowling didn’t have those numbers, but he did spotlight what exactly that breakdown means. This year, the pension, severance and retirement payments to employees were estimated to reach $3.5 million, according to court papers. The pension, severance and retirement accounts had accrued nearly $25 million in liabilities when the company filed for bankruptcy. All due respect, Mistah Mayah, the corn is off the cob – unless the bankruptcy judge steps in to change the deal. We’ll find out tomorrow. 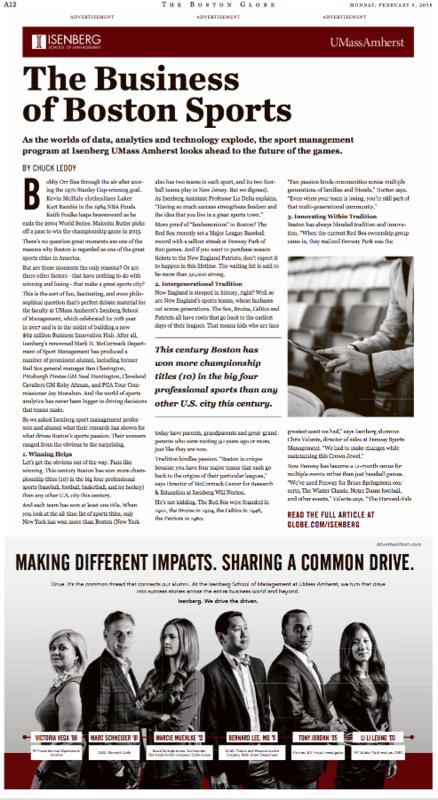 Despite the Boston Globe’s delivery discombobulation yesterday, the hardreading staff was nonetheless remiss in failing to point out this ad in the lately local broadsheet’s Sports section. 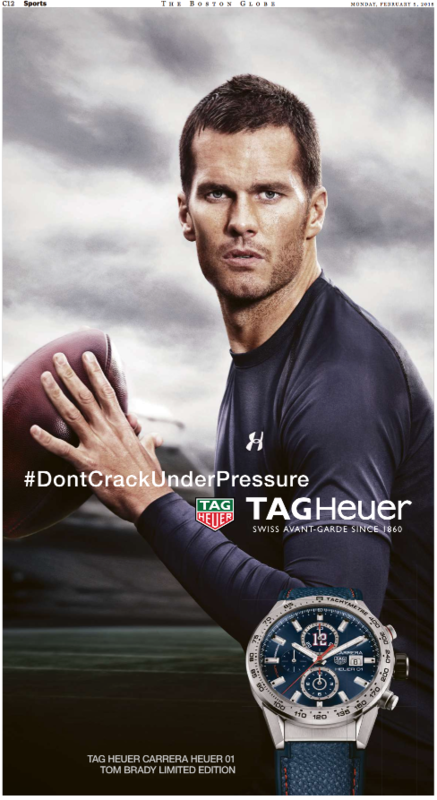 Oddly enough, #DontCrackUnderPressure contained exactly zero tweets about Brady’s, well, cracking in Super Bowl LII. 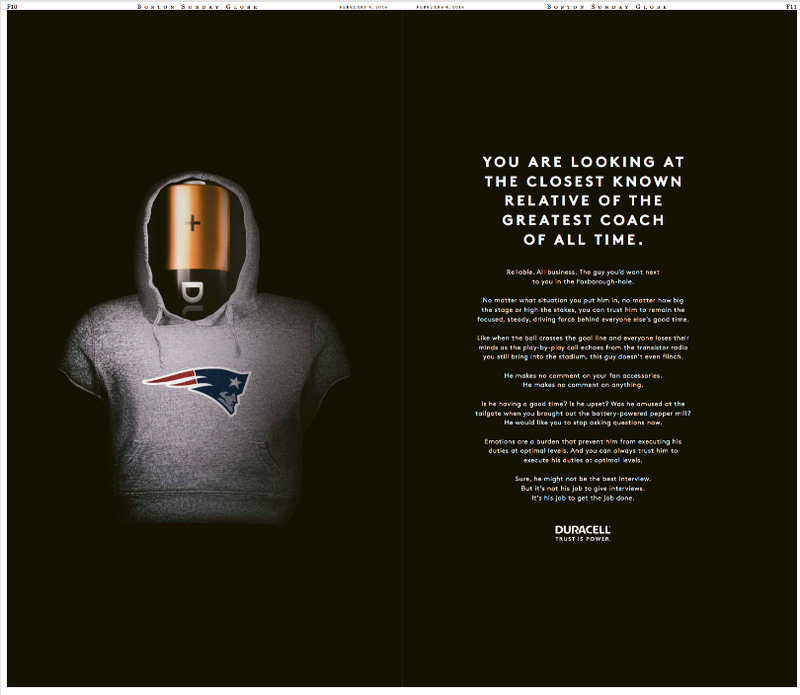 Which says something about either 1) the effectiveness of Tom Brady’s PR machine, or 2) the lack of effectiveness of newspaper ads. 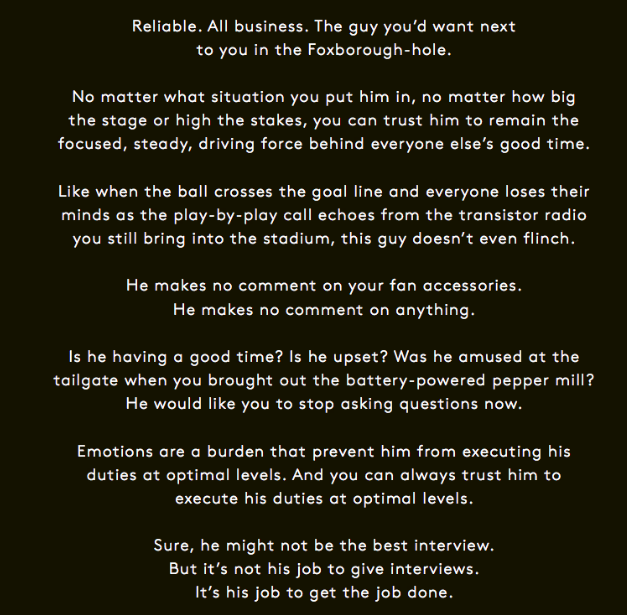 Which got the headscratching staff to thinking – are they paying Belichick? Or is this just an end-around? So we hied ourselves to the Googletron and learned that this campaign has been in the news for several days now, both the print campaign and this TV spot. That ad will air just before kickoff tonight. 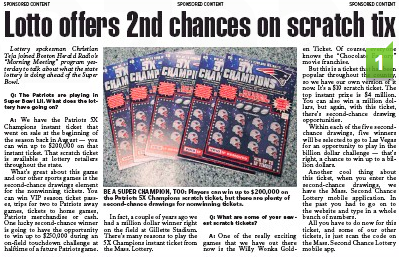 As far as we can tell, Belichick is not being paid. Is he happy about this? Is he upset? Is he amused at the creativity displayed by ad agency Wieden + Kennedy? Would he like us to stop asking questions now? Who cares? We want answers. You are currently browsing the It's Good to Live in a Two-Daily Town blog archives for February, 2018.